This article appeared in Bomb magazine in November 2011. Click here to read the online edition. Who’s in charge? 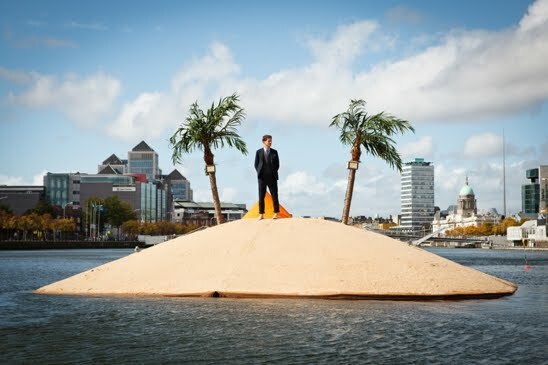 Michele Horrigan takes a look at art in a failing economy. 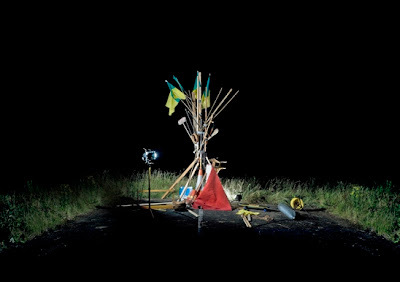 Fergal McCarthy, No Man’s Land, September 2011, Photographic documentation. What’s going on with this country? is a question often heard in Irish streets and homes at the moment. Following a descent from the economic success of the Celtic Tiger, Ireland is now supported with financial assistance from the International Monetary Fund (IMF). A controversial recapitalization of the Irish banks by the government has left many parts of society free-falling away from a high point of a decade of affluence. Many in the visual arts community have explored these instabilities, with emerging artists collectives such as Occupy Space in Limerick and Block T in Dublin programming events and exhibitions in empty commercial spaces in city centers, triggering a new verve into dormant spaces built through an extravagant property bubble that peaked in 2007. With larger state-sponsored art institutions only sporadically addressing these issues, more makeshift cultural initiatives have formed a focused collective consciousness and critical impulse around such immediacies. Individual artists are also tackling this topic with an ability to see beyond economy and find potential. Fergal McCarthy’s project No Man’s Land made an impact on Dublin this September. A fabricated desert island appeared overnight in the midst of the river Liffey, complete with sand, a tent, and palm trees. The intervention was sited in the regenerated urban area of the Docklands, within view of banking headquarters and the International Financial Services Centre. McCarthy, barefoot and dressed in a business suit, lived on the island for nine days, leaving only once during that time due to high winds from the tail end of Hurricane Katia. His consideration of a detached island life, located paradoxically close to the big city, attracted the attention of many passers-by and featured prominently in the Irish media. McCarthy spent his time tweeting about island life, outlining what he ate for meals, encountering herons and swans on the river, and having the occasional conversation with passing boatsmen. Moreover, this temporary and unsteady colonization of the Liffey reflected many aspects of Ireland’s current crisis. McCarthy’s project evoked a subtle form of island romanticism and the maladies of the nation state within what could be perceived as a river of economic woe. Elaine Reynolds, On/Off States, October 2010, Video still, Video documentation of live event. An artwork by Elaine Reynolds produced in October 2010 dealt with the “Ghost Estate” phenomenon. This term was coined for over six hundred unfinished housing estates, with a total of 300,000 houses abandoned, unoccupied or uncompleted due to the financial meltdown of 2008. Seen as contemporary ruins on the suburban edge of almost every small town and city, these places were financed through a now-collapsed mortgage structure and built by private developers working with a mismanaged strategic spatial plan. A great deal of discussion has occurred about the future of these sites, with the prospect that many will be bulldozed in future years. Reynolds’ On/Off States confronts this situation, focusing in particular on the rural regions of the northwest. 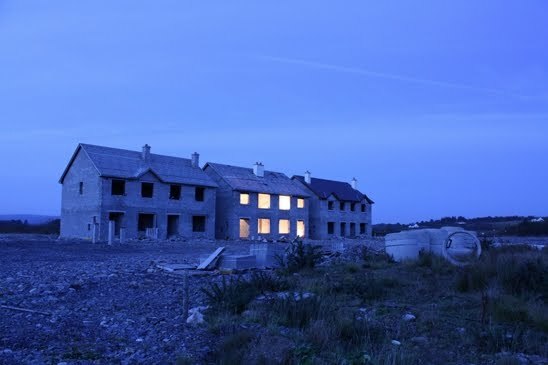 In one such location in Leitrim, lights were installed within the concrete shell of an uncompleted house, electronically programmed to turn on and off in a sequence that signified the S.O.S pattern in Morse code. For one night only, the temporal illumination highlighted an empty concrete husk, devoid of doors, windows, and inhabitants, inverting the notion that lights on meant someone at home. According to the artist, an important part of the work was that there was nobody present inside the building when the lights were flashing, encouraging an insight that the S.O.S was coming from the very structure of the house itself, implying a symbolism not only for this specific site, but to this entire housing construction system. Reynolds’ live event was visible to neighboring houses, motorists and passers-by and was documented and since exhibited as a video work. Oswaldo Ruiz, Askeaton Idle, July 2011. Michele Horrigan works as an artist and a curator and is based in Berlin and Ireland. She was educated in the Stadelschule, Frankfurt and the University of Ulster, Belfast. Recent exhibitions include Project Space, Frankfurter Kunstverein and Gallery of Photography, Dublin. She is founder and curatorial director of Askeaton Contemporary Arts. For more information about Askeaton and their programming, please click here.